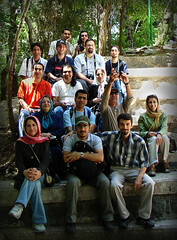 I got an email a few days ago from a Flickr user named Hamed Saber about the first Flickr meetup in Tehran (and, I’m guessing, in Iran). Flickr users in attendance ranged in age from 17 to 58 (and with families, down to 4 or 5). I hear about Flickr meetups in far flung, exotic locales all the time, but this one touched me, partly because I’ve always naïvely romanticized Tehran as a city along with Iranian/Persian culture, and partly because Iran is not a country where using Flickr is all that easy (Flickr is blocked by the Iranian government). Check out the Iranian group and some of the photos from Alireza Abdoli, Saleh Rozati, Nahidyoussefi, ali aghaye gol and others at the event. Also, see photos tagged with تهران., Tehran, ایران, and Iran. "Exotic" is, of course, relative to my own home place. "Naïve" beacause I know embarrassingly little about either the ancient or modern history.